Whether you are swimming in your backyard pool, along the sea shore, or in ocean waters, you'll need several important accessories. 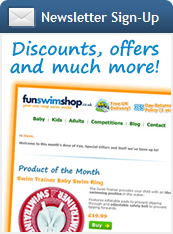 Swim fins, snorkeling masks and snorkels make up some of the most popular swimming equipment. These accessories are designed with swimmers of all ages and abilities in mind. Safety is also an important feature of such swimming equipment, as you don't to get caught off guard while in the water. Fins, masks, and snorkels should also be comfortable, so that you can focus on swimming or enjoying the beautiful underwater views without any distractions. Swimming fins are used for recreational and competitive purposes. The main benefits of using fins are extra stability, maneuverability, and speed while swimming. Fins easily and securely attach to the swimmer's feet, as they mimic the natural movement of marine wildlife that have tails and fins. 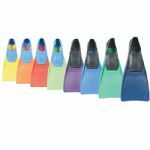 Fins are also used by competitive swimmers for training and developing certain moves, particularly those that heavily involve the feet. So whether you are learning how to swim in your own pool, or enjoying a beautiful swim in the sea, fins will be of great use. When shopping for fins, some brands to consider are Finis, Eyeline, Kiefer, and Speedo. No beach vacation is complete without snorkeling. To enjoy one of the most popular water activities, you will need a snorkeling mask and snorkel. 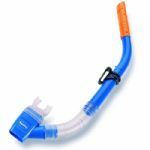 A snorkel must have an anti-splash top, tight fitting mouthpiece, and tube valve that easily drains. You also want to make sure that your snorkel is made of waterproof material, to avoid possible leaks. Such features guarantee that you are safe and comfortable while snorkeling. Snorkeling masks will allow you to clearly see the bottom of a swimming pool, or something more exciting such as crystal clear sea and ocean waters. A snorkel should have a tight seal and adjustable strap for maximum comfort. Wide angle vision is also preferable if you want to enjoy stunning underwater views. When buying snorkeling masks and snorkels, some popular brands to consider are WIN, Mares, Speedo, and Finis.